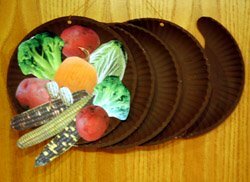 This paper plate cornucopia is a fun children's craft for Thanksgiving! It is a very festive wall hanging for the upcoming holiday. 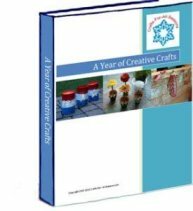 Children will love making it. 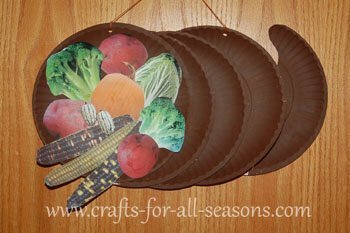 It is very easy to do, and it allows the children to learn about some of the typical Thanksgiving harvest foods by cutting out foods from the grocery store circular ads. This is a great school art project.The homework would be to collect photos of fruits and vegetables for two weeks from magazines and newspapers. The teacher can then discuss all the different foods that were at the First Thanksgiving, and the children can share any special traditions his or her family has for their meal. The cornucopia is a symbol from mythology meaning "great abundance". In mythology the horn was said to be from the goat Amalthaea. Food and drink coming from it flowed in great abundance, as if there was a never-ending supply. 1. 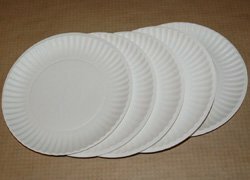 To begin, take the four paper plates and overlap them slightly, as shown below. 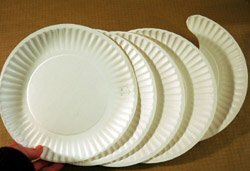 For the last paper plate beneath and to the right, place it slightly higher than the others. 2. Staple the four plates together (adults should help here). 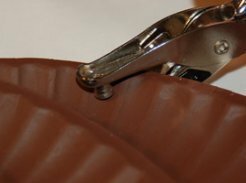 One well-placed staple should do the trick. 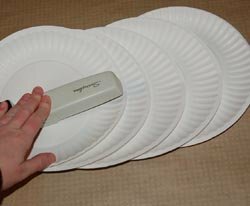 Or, you can glue or tape the plates together. 3. Using the scissors cut out the cornucopia’s “tail” by cutting the very last plate on the bottom of the stack, the plate to the right. See the picture below and use this as a guide. 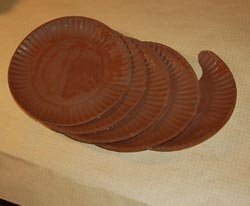 Teachers, if you are doing this as a school project, you can always cut a bunch of the paper plate “tails” ahead of time. 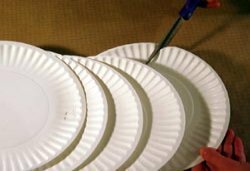 With cheap paper plates you can stack several and cut them at the same time. 4. 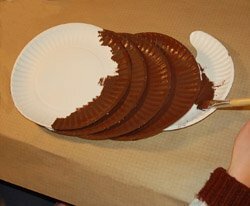 Paint the entire paper plate cornucopia brown, and it dry well. 5. Cut out fruits and vegetable from the grocery store circulars. You should have no problem finding lots of appropriate veggies that are on sale during the month of November. 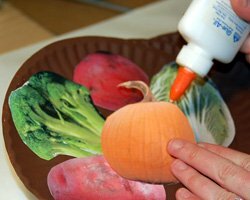 Glue on the foods to the center plate of the cornucopia. 6. Using a hole punch or scissors, make two holes in the top and thread yarn through these for hanging.